I bought three books from there, but the one that intrigued me most was ‘Company Training’ by Brig-Gen R. C. B. Haking, C.B., p.s.c which looked like it had spent some considerable time in the pocket of someone engaged in using it (complete with underlined passages in pencil in places). I’m a sucker for infantry training manuals and this one was pretty cheap because of the battered nature of the cover (although internally it was fine, personally I view the pencil as adding to usefulness rather than damage). 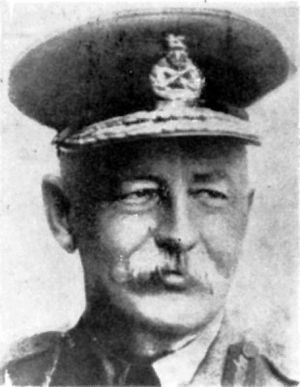 Turns out, on a little googling, that General Richard Haking was also the Divisional commander for the first battle of Fromelles and then the Corps Commander for the second battle of Fromelles in 1916. I’ve been following the Commonwealth War Graves Commission‘s recovery of the bodies from that battle and the re-interring them in the new cemetery at Fromelles. I also recently bought a copy of Paul Cobb’s ‘Fromelles 1916‘ which covers both the battle and the recovery of the bodies and building of the new cemetery. So I’ve got a couple of linked books, although a quick read through the contents and the preface etc, makes the Haking book clearly the work of someone who has seriously thought about soldiering and what it means. Looking at his service record, even by 1913 he was a combat veteran, including some very modern counterinsurgency in the Boer wars. I doubt he’d be very much out of place in today’s British Army and I’d think that his book would be worth reading by junior officers and NCOs (and even private soldiers who aspire to be career soldiers). I’ll write a proper review when I’ve read it all.